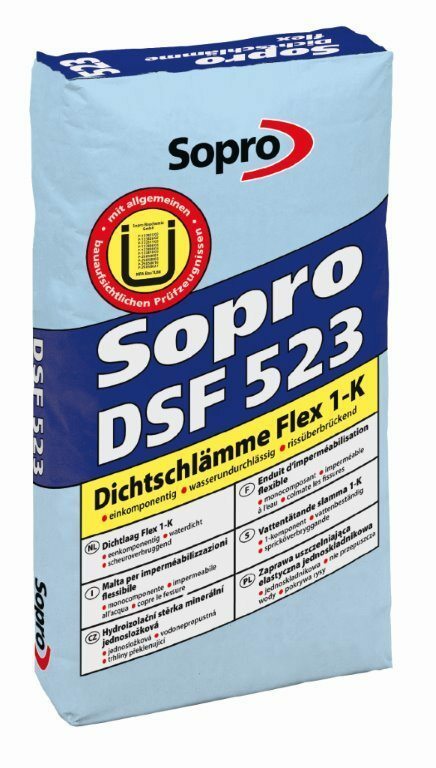 Sopro DSF® 523 Tanking Membrane is a flexible, one-component, cementitious sealing slurry used to produce crack-bridging waterproof membranes (for composite systems comprising membrane and tile finish). Low-chromate to Regulation (EC) No 1907/2006, Annex XVII. With national test certificates (abP) to ZDB (Federation of the German Construction Industry) data sheet on waterproof membranes: “Guidance on indoor and outdoor installation of composite liquid waterproofing systems with tile finish; August 2012”, for Moisture Exposure Classes A and B with high exposure (regulated applications) and for Moisture Exposure Classes A0 and B0 with moderate exposure (non-regulated applications). 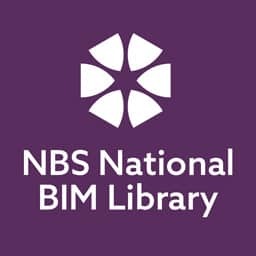 Suitable mineral substrates, including concrete, lightweight concrete, aerated concrete, cement and lime/cement render, gypsum plasterboard and gypsum fibreboard, renders made from masonry cement, plane, flush-jointed masonry (no composite masonry), cement screeds, calcium sulphate-based (anhydrite and self-levelling anhydrite) screeds, board subfloors, existing ceramic coverings.Sopro DSF® 523 Tanking Membrane is a flexible one-component, cementitious sealing slurry used to produce flexible, crack-bridging waterproof coatings. 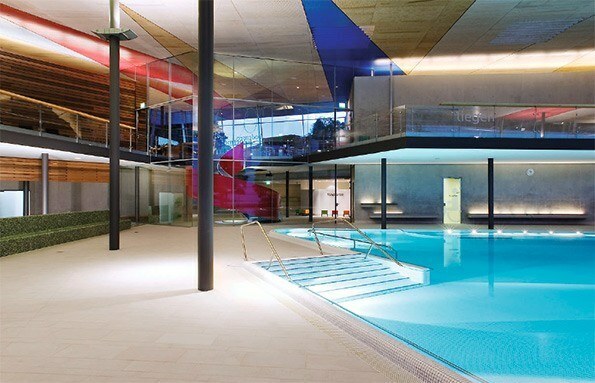 This waterproof membrane can be used on balconies, patios, in showers, washrooms, toilets and swimming pools, applied prior to tiling (as part of a composite system with membrane and tile finish). 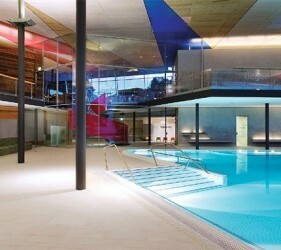 For refurbishment of solid, strong existing tile coverings on balconies and patios. For internal coating of process water tanks with max. 4m water depth. Provides flexible, crack-bridging waterproof barrier for protection/preservation of structures and building elements. 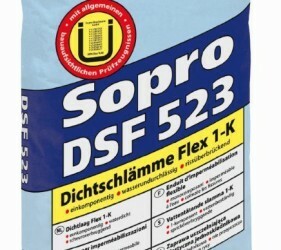 Pre-wet cementitious substrates so as to ensure that they are slightly damp prior to application of Sopro DSF® 523. 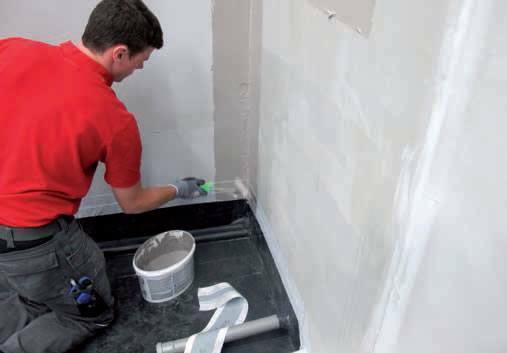 Single pre-wetting generally suffices for new, unsoiled cementitious substrates. Coat Thickness Coat Thickness/Coverage Dry coat thickness to national test certificate (abP) for Exposure Classes A and B: min. 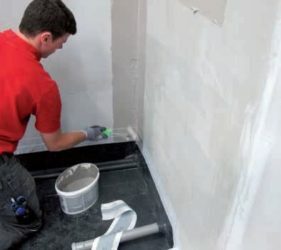 2 coats = 2 × 1.0 mm (2 × 1.3 mm wet coat thickness); max. dry coat thickness: 4 mm. Water tanks with water depths < 4 m: min. 2.5 mm dry coat thickness. Coverage approx. 1.4 kg powder/m² per mm dry coat thickness. Drying Time Approx. 4 hours per coat. 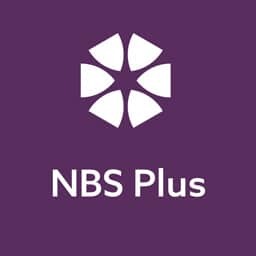 Available in 20kg and 10kg bags.